College admissions interviews can be a stressful challenge for some, especially if you are a bit introverted, shy, or uncomfortable opening up to strangers. Luckily, admissionsmom is here to help you prepare for your college admissions interview. I talk to lots of admissions officers each year, picking up admissions secrets and tips along the way. 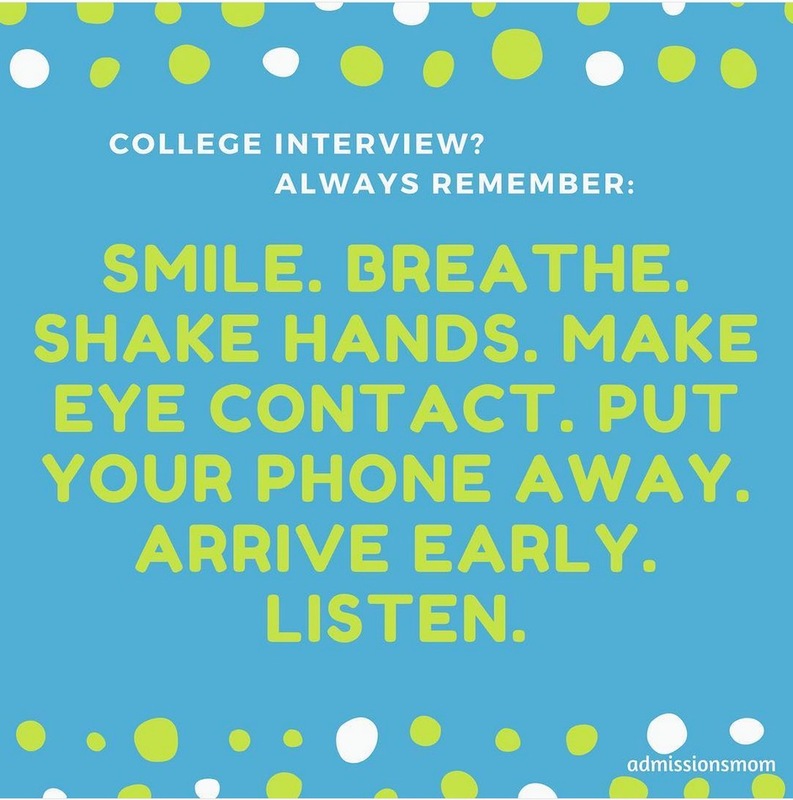 Here are my college admissions interview tips that can work for anyone. Lean into your nerves. It is ok to tell your interviewer that you are nervous, or even shy. They will understand. One good way to work through your nerves is to focus on your breathing. Inhale through your nose and take long, measured breaths. This can help you feel calm quickly. Before the interview, the best thing is to prepare well. Researching the university and coming up with talking points before your interview will help you feel assured and confident. Envision yourself having a good interview. Mental visualization is a simple trick that has been proven to work. Wear proper attire. Boys, preferably wear a button-down shirt with professional pants or a nice pairs of jeans. If you do not have a button down, a polo shirt or clean t-shirt is fine. Girls can wear similar clothes or a skirt. Business casual attire is always appropriate. Make sure to look presentable. That means combing your hair, washing your face, brushing your teeth. Come prepared with a couple questions. Having questions about the university and interviewer shows that you are prepared and demonstrates interest. Be careful not to show up with memorized canned responses though. Interviewers just want to chat with you, learn about you, and tell you anything you would like to learn about the school. Smile and shake hands. A good handshake uses about the same amount of force as holding a door knob open. A nice smile tells the interviewer that you are excited to meet them, warm, and confident. Additionally, you should make good eye contact. Arrive early. Being punctual requires no talent or ability but shows that you are mature and serious about the interview. Try to arrive fifteen minutes before your scheduled meet time. Make sure you look at google maps the night before and plan your route if you are unfamiliar with the interview site. Put your phone down. Listen. Admissions officers tell me that the most important hint I can share with you is to listen and be attentive while the interviewer is speaking. Put your phone away before the interview starts, being on your phone is extremely rude and inattentive. Think about what the interviewer is telling you and try to give relevant responses. Whomever you are speaking with expects a two-way conversation and for you to process the information they are giving you. Relax! College admissions interviewers are not out to get you. The interviewer’s goal is usually to collect enough information about you to give a positive recommendation to the college or university. Make sure to come prepared with enough information about the school and yourself to help them achieve this.